Recognizing faces is an important social skill, but not all of us are equally good at it. Some people are unable to recognize even their closest friends (a condition called prosopagnosia), while others have a near-photographic memory for large numbers of faces. In a recent study of twins, researchers at MIT and in Beijing, China, have shown that face recognition ability is heritable and that it is inherited separately from IQ. This finding plays into a long-standing debate on the nature of mind and intelligence. The prevailing “generalist” theory, upon which the concept of IQ is based, holds that if people are smart in one area they tend to be smart in other areas. So if you are good in math, you are also more likely to be good at literature and history. IQ is strongly influenced by heredity, suggesting the existence of "generalist genes" for cognition. Yet some cognitive abilities seem distinct from overall IQ, as happens when a person who is brilliant with numbers or music is tone-deaf socially or linguistically. Also, many specialized cognitive skills, including recognizing faces, appear to be localized to specialized brain regions. Such evidence supports a “modularity” hypothesis, in which the mind is like a Swiss Army knife--a general-purpose tool with special-purpose devices. “Our study provides the first evidence supporting the modularity hypothesis from a genetic perspective," said senior author Dr. Jia Liu, Professor of Cognitive Neuroscience at Beijing Normal University. "That is, some cognitive abilities, like face recognition, are shaped by specialist genes rather than generalist genes." “Our finding may help explain why we see such disparities of cognitive abilities within the same person in certain heritable disorders,” added co-author Dr. Nancy Kanwisher of the McGovern Institute for Brain Research at MIT. The down-regulation of a key gene in the striatum, a region of the brain attacked in Huntington disease (HD), may be a defensive measure taken by striatal cells to try to avoid ultimate destruction in the HD process. The down-regulated gene (CalDAG-GEFI) is normally highly enriched in the striatal cells that are targeted in HD. An MIT research team, together with collaborators, showed that CalDAG-GEFI gene expression is dramatically down-regulated in the brains of individuals with HD, as well as in mouse models of the disease. By following mutant mice for up to nine months, the researchers further showed that this reduction occurred gradually, in parallel with the progression of the disease. These progressive changes suggested that CalDAG-GEFI is likely to play some role in the disease process. The researchers wanted to determine whether the suppression of this gene is part of the death process, or whether it represents part of the brain’s protective response. They found that the latter explanation appears to be true--when the researchers artificially blocked the expression of CalDAG-GEFI, the striatal neurons were protected from damage induced by the mutant huntingtin (Htt) protein. 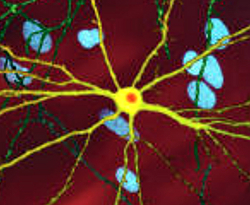 “So the enriched expression of CalDAG-GEFI in the striatum may explain, in part, why striatal neurons are particularly vulnerable to the expression of mutant Htt,” explained first author Dr. Jill Crittenden of the MIT McGovern Institute for Brain Research. “Switching off of the CalDAG-GEFI gene may represent the neuron’s attempt, ultimately unsuccessful, to save itself.” The researchers hope that by understanding the molecular pathway by which neurons are killed, their findings may suggest new strategies for the development of treatments that could slow or even prevent the progression of HD. Scientists from Johns Hopkins and collaborating institutions have discovered a clue as to how schizophrenia might develop after puberty as the result of genetic influences that occur in early development. In a new study, the researchers have manipulated (knocked down) a known schizophrenia susceptibility gene (DISC-1) in the brains of fetal mice in an attempt to unravel the complex link between prenatal brain development and the maturation of information processing and cognition in adult animals. The scientists showed that a transient reduction of DISC-1 (disrupted in schizophrenia-1) gene expression in the mouse prefrontal cortex just before or after birth led to aberrant changes in adult animals that are associated with schizophrenia--including perturbation of specific dopaminergic brain pathways, disruption of neural circuitry, and severe behavioral abnormalities. These findings are significant because they provide a concrete link between a nonlethal genetic disruption during prenatal brain development and specific abnormalities in adult brain maturation. "Prior to our study, the kinds of neurodevelopmental defects that cause the defined anatomical changes observed in schizophrenia patients--clinical onset 15+ years after birth, psychosis, impaired cognition and information processing, and aberrant dopaminergic neurotransmission--were not clear," offered Dr. Toshitaka Nabeshima, the senior author of the report. "However, the model in our study represents a majority of these characteristics.” The authors were careful to caution that while their findings shed some light on how early disease-associated events impact adult brain function, manipulation of one gene cannot fully define the complex neuropathology associated with schizophrenia.